Closing out my recent string of posts on whimsical miniatures, I present models that can be used as magical ponies. The first miniature comes from the Reaper Evil Toys blister (02887). It is of typical Little Pony proportions, with thick legs and tattooed backside. The second miniature is a 15mm Irregular horse (FAN14). This is the basic miniature that I will be using for my magic pony conversions. Last are a unicorn, and winged horse from the Reaper Foals blister (02207). These two miniatures were sculpted by Rene Perez, which leads me to believe that they were originally 15mm figures intended for the Shadow Corp line. The ponies range in size from 8 to 11 hands high, and are suitable for adult Little Ponies. Irregular has 10mm horses as well, so I'll probably have to order some in the future to create baby Little Ponies. 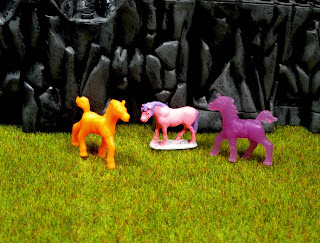 I also have some plastic "alicorns" that came from a 1/72 medieval playset. The ones in my set were made in purple, and a fluorescent orange plastic. The orange one is almost impossible to photograph, so I'm not showing it in this picture. They stand at 12 hands high. Here is my first pony conversion. I gave it a Kneadatite weave, and fixed up the right side of its head a bit. 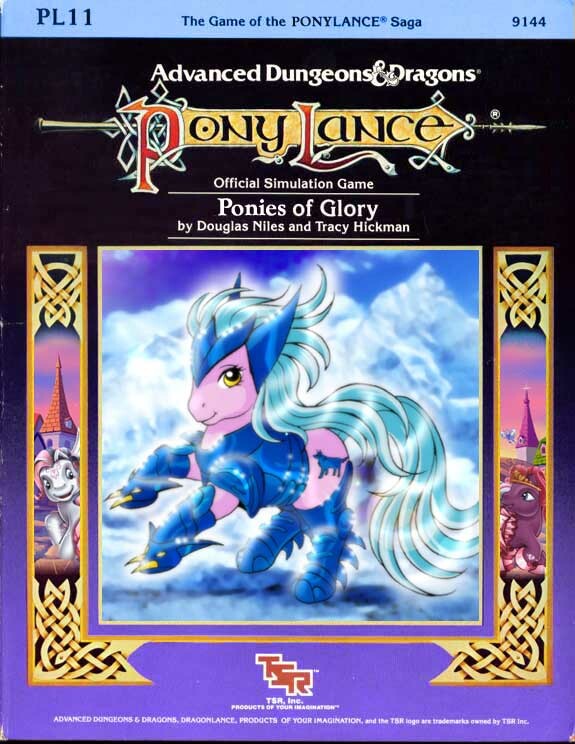 Even after lengthening the mane, the miniature looks rather subdued as far as magical ponies go. I may have to work on introducing a bit of that poofy glam rock hairstyle look for my next ponies. When I first painted up the pony, it had a white mane, and was almost physically painful to look at. I changed the color of the mane to lavender, so it would be a little easier on the eyes. In closing, for those of you who remain skeptical about using ponies in dungeoncrawls or for wargaming, allow me to present evidence that even Wolverine is down with My Little Pony. Good idea but wouldn´t the price be a bit much for the ponies?? @Lobo - Thanks for reading! It's always nice to get feedback. 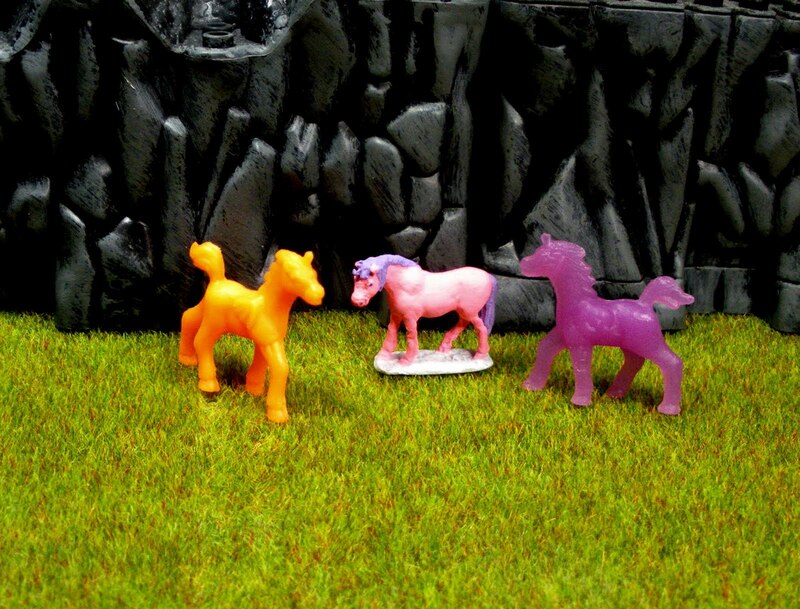 @Paul - The Reaper minis are certainly not cheap, but the Irregular horses are only 60p a pair.